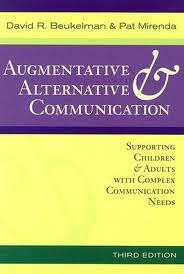 Augmentative & Alternative Communication: Supporting Children & Adults with Complex Communication Needs by David R. Beukelman & Pat Mirenda. This textbook presents a life-span approach to improving the lives of children and adults who have severe communication disorders due to autism, traumatic brain injury, intellectual disabilities, or sensory impairments. Step-by-step intervention approaches are offered, as well as thorough discussions of principles and procedures of assessment; planning and implementation of AAC intervention; symbol options; alternative access; message management; vocabulary selection; service delivery. Pp. 634. This entry was posted in Communication, Our Library and tagged Autism Spectrum Disorder, books, Communication. Bookmark the permalink.